Ludhiana is a city and a municipal corporation in Ludhiana district in the Indian state of Punjab, and is the largest city north of Delhi. It is the largest city in the state, with an area of 310sq. km and an estimated population of 1,789,650 as of the 2015. The population increases substantially during the harvesting season due to the migration of labourers from the eastern states of Uttar Pradesh, Bihar, Odisha. The city stands on the Sutlej River's old bank, 13 kilometres (8.1 mi) south of its present course. It is an industrial centre of northern India, and was referred to as India's Manchester by the BBC. Ludhiana is located 98 kilometres (61 mi) west of the state capital Chandigarh on NH 95 and is centrally located on National Highway 1, which runs from the Indian capital New Delhi to Amritsar. It is also located 315 km (194 miles) north of Delhi and 142 km (88 miles) southeast of Amritsar. Ludhiana is located at 30.9°N 75.85°E﻿ / 30.9; 75.85. It has an average elevation of 244 metres (798 ft). Ludhiana City, to its residents, consists of the Old City and the New City (or the residential and official quarters of the colonial British encampment, traditionally known as Civil Lines; this is as opposed to the Army Lines, which are no longer extant as the British Cantonment was abandoned in 1845). The land dips steeply to the north and the west where, before 1785, the river Sutlej ran. The Old Fort was at the banks of the Sutlej (and now houses the College of Textile Engineering). Legend has it that an underground tunnel connects it to the fort in Phillaur – although why this should be is debatable, as the Sutlej was the traditional dividing line between the principalities, often occupied by enemy forces (see History section). The ground is of yellow sandstone and granite, forming small hillocks, plateaus and dips. The tree of largest natural extraction was the kikar, or Acacia indica, but has been supplanted by the eucalyptus, transplanted from rural Australia in the late 1950s by the government of Chief Minister Pratap Singh Kairon. Gulmohars and jacarandas were planted by the British along the avenues of Civil Lines, as were other flowering trees, while the Old City contains almost no vegetation or parks, except for a few isolated pipal trees, holy to the Hindus, as it is supposed to be the abode of Lord Shiva. Ludhiana features a humid subtropical climate under the Köppen climate classification, with three defined seasons; summer, monsoon and winter. Ludhiana on average sees roughly 730 millimetres (29 in) of precipitation annually. Ludhiana has one of the worst air pollution problems in India, with particulate matter being over six times the World Health Organization recommended standard, making it the 13th most polluted city in the world. Industrial water pollution is also of significant concern in portions of Ludhiana, notably along the Budha Dariya. As per provisional data of 2011 census Ludhiana had a population of 1,618,879. The literacy rate was 82.50 per cent. This population consists of 950,123 males and 743,530 females. The World Bank ranked Ludhiana as the city in India with the best business environment in 2009 and 2013. The riches are brought mostly by small-scale industrial units, which produce industrial goods, machine parts, auto parts, household appliances, hosiery, apparel, and garments. Ludhiana is Asia's largest hub for bicycle manufacturing and produces more than 50% of India's bicycle consumption of more than 10 million each year. Ludhiana produces 60% of India's tractor parts and a large portion of auto and two-wheeler parts. Many parts used in German cars like BMW and Mercedes are exclusively produced in Ludhiana to satisfy the world requirement. It is one of the largest manufacturer of domestic sewing machines. Hand tools and industrial equipment are other specialties. The apparel industry of Ludhiana is famous all over India for its woollen sweaters and cotton T-shirts; most of the top Indian woollen apparel brands are based in Ludhiana. Ludhiana also has a growing IT sector with multiple software services and product companies having development centers in the city. Ludhiana is also home to the Ludhiana Stock Exchange Association. Ludhiana has 363 senior secondary, 367 high, 324 middle, 1129 primary, and pre-primary recognised Schools, with a total of 398,770 students. Most of these schools are either run by the Central Board of Secondary Education or by Punjab School Education Board. Other boards like convent boards are there too. The city has many prestigious school chains, such as Mount Litera Zee School (A unit of ZEE Learn Ltd.), Guru Nanak Public School, Green Land Public School, Vardhman International Public School, Sacred Heart Convent Senior Secondary School,Harvest International School, Delhi Public School, R.S. Model Senior Secondary School, BVM School, Ryan International School, Saint Thomas Senior Secondary School(near CMC), and DAV School. Sat Paul Mittal School in Ludhiana is located at Dugri, Phase II. This school is one of the few ICSE schools in Ludhiana. Kundan Vidya Mandir is the oldest school in the city, established in 1940, and Government Senior Secondary School (multipurpose) is also one of the oldest schools in the city. Ludhiana is home to the largest agricultural university in Asia and one of the largest in the world, Punjab Agricultural University. The College of Veterinary Sciences at PAU was recently upgraded to the Guru Angad Dev Veterinary and Animal Sciences University (GADVASU). Christian Medical College, Ludhiana, the first medical school for women in Asia, was founded by Dr Dame Edith Mary Brown in 1894. Christian medical college is a major and reputed tertiary care hospital in India where the world's first face transplant was done. Dayanand Medical College and Hospital is a tertiary care teaching hospital in Ludhiana. This institution is recognised by the Medical Council of India. The college is affiliated to Baba Farid University of Health Sciences, Punjab. Guru Nanak Dev Engineering College is an institution offering facilities and education for engineering students. It has a research and development centre for bicycles and sewing machines. There is also the Research & Development Polytechnic College. There are also other institutes catering to local and surrounding areas such as Institute of Banking Services (IBS). Ludhiana has many management colleges providing courses such as Bachelor of Business Administration (BBA), Hospitality and Management (HM), Airlines Tourism and Hospitality Management (ATHM), Bachelor of Computer Applications (BCA), and Bachelor of Commerce (B.Com). There are a few good colleges providing these courses both part-time as well as full-time, such as University Business School (UBS), Panjab University Regional Centre, the Punjab College of Technical Education (PCTE), Synetic Business School (SBS) Punjab Agricultural University (PAU), Sri Aurobindo College of Commerce and Management (SACCM) and Government college for boys and Government college for girls. Khalsa College and Arya college are also present to study as a part-time student. Ludhiana is well connected by road and rail as Ludhiana railway station is on the main Delhi-Amritsar route and is an important railway junction with lines going to Jalandhar, Ferozepur, Dhuri and Delhi. The city is very well connected with daily or weekly trains to most places in India including the major cities of Jammu, Amritsar, Jalandhar, Patiala, Pathankot, Kanpur, Jaipur, Chandigarh, Ambala, Panipat, Delhi, Mumbai and Kolkata. For administrative reasons the station is under Ferozepur Railway Division. The railway line between Ludhiana and Chandigarh opened in 2013. The government has even passed a dedicated freight track between Ludhiana and Kolkata. Ludhiana is served by the city based Sahnewal Airport ((IATA: LUH, ICAO: VILD)), also known as Ludhiana Airport. It is located near the town of Sahnewal, 5 km (3.1 mi) southeast of Ludhiana on the Grand Trunk Road. The airport is spread over more than 130 acres. The current airport arrival/departure halls can accommodate 40 passengers. The baggage delivery is done manually. Air India Regional ATR flight service is thrice a week. With the given infrastructure Air India has been ensuring great efforts for a sound service thrice a week to this manufacturing sourcing destination. From June 1, 2014 one to and fro Ludhiana-Delhi flight of Air India from Sahnewal domestic airport has been withdrawn. Ludhiana Junction railway station is well connected to other metro cities. 12037/New Delhi - Ludhiana Shatabdi Express is an important train that starts here. This project has been scrapped by the government because lack of funds. The government has signed a Memorandum of Understanding with Delhi for construction of a Ludhiana Metro. This light transit system will serve about 25 years to Ludhiana. There will be two corridors in Ludhiana Metro. These two corridors of metro will give relief to many roads to some extent. Ludhiana is connected with other cities of Punjab and also with other states by bus service. Several major national highways, NH1, NH95, NH11, NH20 pass through the city. The transportation services are provided by the state owned Punjab Roadways and private bus operators. City business service has been cancelled. Moving around inside the city is done mostly by city-buses, auto-rickshaws, and cycle rickshaws, while latest Ludhiana BRTS is under construction. The Auto rickshaw is a three-wheel drive vehicle, which is one way to travel in the city. They have the capacity to hold three to six passengers. It can be hired individually or on a sharing basis. The auto rickshaws are easily available at every major place, including the interstate bus terminal and the railway station at a nominal fare which varies from ₨ 10 to ₨ 30. Jugnoo, an on demand auto rickshaw application launched its operations in February 2015 to provide low cost, reliable, 24 x 7 service to the citizens of Ludhiana. Cycle rickshaws are widely used in Ludhiana. The rickshaw or tricycle is pulled by a person and is a relatively cheap way of traveling in the city, but has become pricey after the autos were being scrapped. Nowadays many electric rickshaws are also available in Ludhiana and most of them can be spotted on the road which connects Samrala Chowk to Station. For shopping, markets such as Chaura Bazaar, Ghumar Mandi, Jawahar Nagar Camp, Kipps Market and Mall Road are good places to buy from, but parking may be an issue in such areas. Malls such as Westend Mall (Wave Mall), MBD Mall, Silver Arc and Pavilion mall are good attractions as big malls. The Grand Walk, Flames Mall, Ansal Plaza, SRS Mall and Govardhan City Center are some good medium-sized malls. 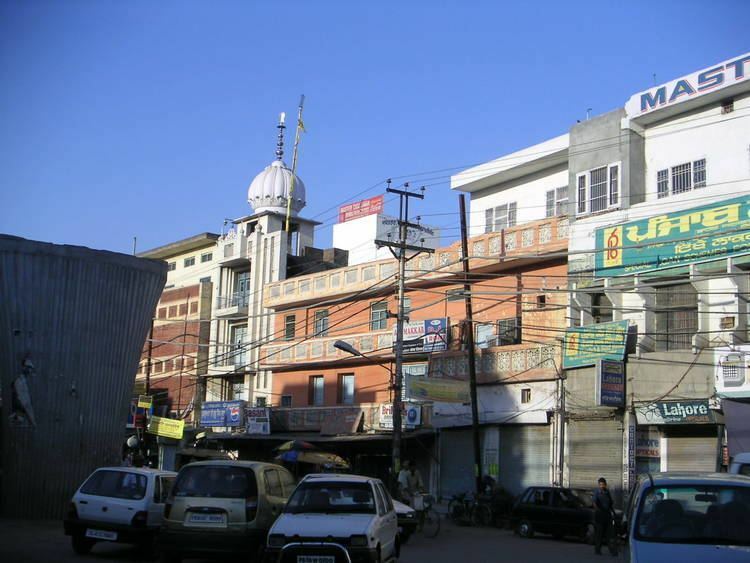 Ludhiana is a mixture of urban and rural living. The city is surrounded by farming land on every side but inside the city are many parks that still exist for relaxation, walking and picnics. Parks such as Leisure Valley, Rose garden Rakh bagh and PAU are good places to walk and spend time. Guru Nanak Stadium is known for hosting the Kabaddi matches along with athletic games. Kabaddi world cup finals have been played twice in Guru Nanak Stadium Ludhiana. The stadium often hosts high-profile Kabbadi matches. A skating rink for speed skating and roller hockey is in Leisure Valley, Sarabha Nagar. Many skaters like Saurabh Sharma and Harshveer Singh Sekhon made Ludhiana proud by winning many medals at district state and national championships and representing India at various World Championship events. Kila Raipur Sports Festival, popularly known as Rural Olympics, is held annually in Kila Raipur, near Ludhiana. Competitions are held for major Punjabi rural sports, including cart races and rope pulling.